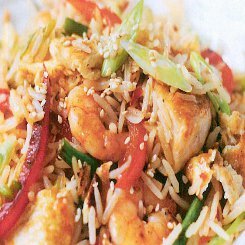 One of my favourite Chinese meals is chicken and prawn fried rice that I order about 8 of 10 times I have Chines takeout so I set out to find an easy to prepare alternative that tastes just as good as the local Chinese takeout. It’s really important to have a very hot wok or pan when you start and to work quickly, making sure that the ingredients get a quick scalding that adds a bit of colour. This is for 2 hungry people and it wont keep for long if you use the prawns so take whatever you have left to work for you. Cook up the rice by following the instructions on the pack. You don’t have to use basmati rice, any rice really and in fact if you are a little more health concious than I am, use brown rice. Once cooked, drain in a sieve, place back over the pot and cover with a dish cloth to keep it warm. In a bowl add the soy sauce, sweet chili sauce and the sesame oil, give it a whisk with a fork and set aside. Now heat your wok or large pan to very hot, add the oil and it should give off a little smoke. Now toss in the chicken pieces and move them around quickly for about 3 minutes. They should colour easily and be nice and golden in places. Remove them and set aside. Add a little more oil, then the beans and red peppers, quickly move them around until they begin to colour. This should also only take about 2 or 3 minutes. Now add the prawns, garlic and ginger and quickly move them around until the prawns colour and the meat is turning white, also about 2-3 minutes. Now add the cooked rice and mix well, fliipping it with your spatula to combine all of the ingredients and heat them. Make a space on one side, add the egg and allow it to cook for a few seconds, then use a fork to break it up and mix into the rice. Now add the chicken, the sauce and the spring onions, stir and move around until it’s all steaming andf ready for the plate. It sounds like a lot of work but really it’s quite simple. Be sure you have a large pan if you do not have a wok or do it in 2 halves, the process is quick enough. Slice your chicken breasts into strips that are about 1cm thick and pop them into a bowl with the cajun spice. Give them a good mix about to distribute the cajun spice evenly over the sliced chicken. Put a wok or large pan on a high heat with a little sunflower oil and fast fry the chicken pieces in batches until nicely browned in parts. Don’t fuss if the pieces seem partly uncooked, they will keep cooking once removed and still have more cooking to come. What you are looking for is little browned patches on the strips. Remove the chicken and set aside. Now in the same wok quickly stir fry the onions and peppers until they are just beginning to soften, you still want them crunchy. Mix together the maizena and the lemon juice. Add all of the onions and peppers back to the pan, add the lemon juice and mazena mixture, water, sugar and butter, stir and bring to the boil. Now add the chicken and stir about for another minute or two until the chicken is coated in the delicious sauce. 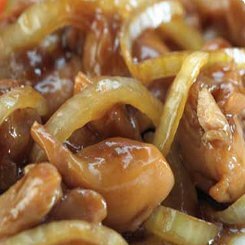 If you have ever had Teriyaki chicken at a Japanese restaurant, this is as close as it gets and if you have not yet tried Teriyaki chicken, you want to try it, it is very simple and incredibly tasty. When you serve this up to your friends or family they are going to Love it and the best part is that it takes just a few minutes and is no effort at all. It’s all about the marinade and the Mirin is a must, so pop into your local Chinese deli and grab a bottle. This marinade works brilliantly for chicken skewers on the braai as well, just do them near the end of the cooking so that the coals are not too hot. Place all of the marinade ingredients into a bowl and give it a good stir to dissolve the sugar. 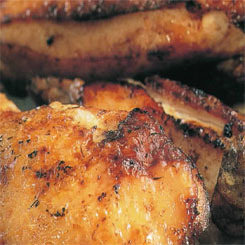 Pat your chicken dry with a tea towel and slice into strips about 1cm in wide. Add the chicken to the marinade, cover with cling film, shake it about to coat each piece with marinade and set aside. 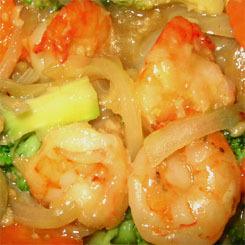 In a pan on a medium heat, add a little oil, toss in the onions and slowly cook them until they are translucent and soft. Try not to brown the edges, then remove and set aside. Wipe the pan, add a little more oil and now cook the chicken pieces in 3 or 4 batches on the same heat until nivcely browned on both sides. They will brown quite quickly as the sugar caramelises. Don’t fret if you think they are not cooked through. Once you have browned all of the pieces, add them back to the pan, pour in the remaining marinade, put on a lid, and leave it to simmer for a 3 minutes. Now remove the lid, add the onions, stir and simmer for another 3 minutes or so until the sauc e begins to thicken. Thats it, you are done and this is seriously delicious. Drape over rice or salad. 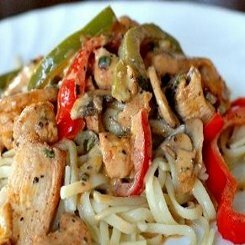 First make the sauce by adding all of the ingredients to a small pot on a medium heat, stir until it comes to a slow simmer and allow to simmer for 5 minutes stirring from time to time. Remove from the heat and leave to cool. 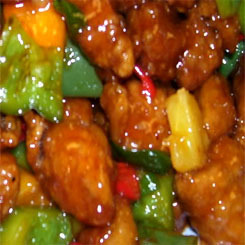 Place the chicken strips in a bowl and season with salt and pepper, add the lemon juice, garlic and pinch of chili powder. Mix it up, cover and place in the fridge for about 30 minutes. Thread the chicken onto the skewers but not too tightly. You want them to cook quickly and evenly. If they are too tightly packed you are likely to have raw insides. 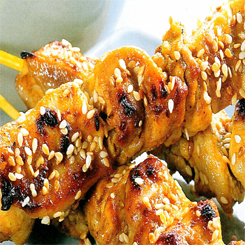 Place the skewers on a rack in a roasting pan and grill under a hot grill in the oven until cooked through. Turn at least twice and brush over a bit of the satay sauce at each turn. When cooked place them on a platter, sprinkle with sesame seeds and serve with the rest of the satay sauce in a bowl for dipping. YUUUUUMY I tell you. 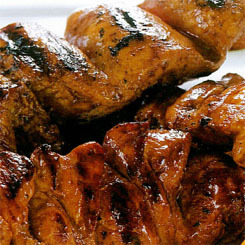 You will also love these Sweet Thai pork morsels, give them a try as well. You want to split the chicken breasts through the center and then cut into strips, so each breast should give you 4 x 4cm wide strips. 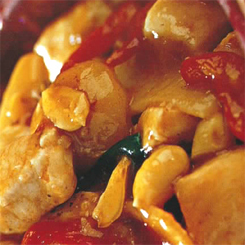 Mix all of the marinate ingredients together in a bowl, give it a whick and add the chicken. Mix the chicken around a bit to cover each piece in the marinate. Cover with cling film and place in the fridge for a few hours, overnight if you can. Serve them with chinese fried noodles or egg fried rice, or just as they are for finger food. Take a large pot that the whole chicken will fit into easily and fill ½ way up with water. Bring the water to the boil. Remove from the heat and submerge the chicken in the boiling water. Cover the pot and leave for 30 minutes. This partly cooks the chicken and allows it to absorb extra water. Remove the chicken and set on a rack to drain. Pat dry with a clean cloth. Now combine the honey, five spice and vinegar together in a bowl and mix well to combine. Place the chicken on a plate and brush the skin with the glaze mixture and place in the fridge for 20 minutes. Repeat this process about 4 times until there is no glaze left over. After the last glaze leave it in the fridge for at least 2 hours, then use kitchen scissors to cut into 4 portions. When you are ready to cook, heat enough oil in a pot on high or almost smoking to cover the chicken pieces. When it reaches the smoking level, reduce the heat to medium and use tongs to add each piece to the oil. Deep fry for 5 minutes and once done set aside on absorbent paper to drain. It’s really good I tell you. 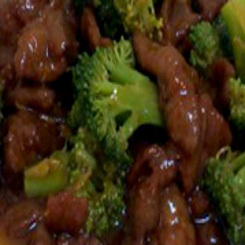 Here are a few other Chinese recipes for you to try. Heat a wok or frying pan on a high heat, add the oil and then chilies and garlic. Toss it for a few seconds to coat them in oil and begin sizzling. Now add the chicken pieces and chili bean sauce, toss it around for about 3 minutes until the chicken pieces are white on the outside. Now add the stock, bamboo shoots, water chestnuts, peanuts and rice wine or sherry and allow to boil. Add the cornflour mixture, stir and allow to thicken. Keep stirring until it is fairly thick and shiny. Transfer to a serving dish and prepare to impress. It’s best served with short grain rice that is quite sticky but each to his own. Ebjoy it folks it is fantastic. You should always serve a few different Chinese dishes and this Lemon Chicken recipe will certainly compliment it. Get some water boiling furiously on the stove or your steamer really sending it. On a plate that will fit inside your steamer you want to layer your prawns covering the entire plate. Whisk together all of the rest of the ingredients in a small bowl to really combine the flavours and then pour the sauce over the prawns evenly, leaving nice little mounds of galic on the top. Place the plate into your steamer carefully being careful not to burn yourself. You may want to remove the steamer first or take off the layer for the plate if you are using an electric steamer. Steam them for 3/4 minutes or so until they are pink and firm. The tricky part is removing the plate without burning yourself so be careful. Thats it, fantastic fresh garlic prawns. You can also chop up a handful of coriander leaves to top it off if you are serving it with rice or yellow rice. If you do burn yourself the best thing to do is to mix bicarb of soda with water from the tap into a thick paste and cover the burn. It’s amazing, it takes away the sting immediately. heat the oil on medium to high in a pan or wok, if you are using a pan add a little extra oil. Place the maizena in a separate bowl. Beat the egg white and the pepper together and dip each piece of pork nto the egg white, give it a shake and then into the maizena, give it another shake to remove any excess maizena. Cook the pork for about a minute or so on each side until they are nicely browned. Remove the pieces that are done and then add all of them back to the wok and give them a toss around in the wok to heat up and cook through properly, (about 2 minutes) and remove from the pan and place into a serving bowl. Now add all of the sweet and sour sauce ingredients to a pot except the maizena mixture, bring to the boil and allow to simmer for about 1 minute. Turn down the heat to low, add the maizena mixture and stir until nicely thickened and glossy. This should not take more than 2 or 3 minutes. Pour the sauce over the pork and serve with egg fried rice. YUMMY I tell you.